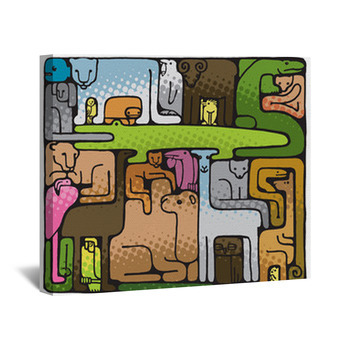 Rescue both the animal kingdom and your decor with some Noah's Ark themed wall art. These designs range from colorful imagery with a Life of Pi feel to jumbles of animal shapes with the touch and tones of Africa. Giraffes, monkeys, hippos, rhinos, zebras, elephants, lions; where would we be without them? 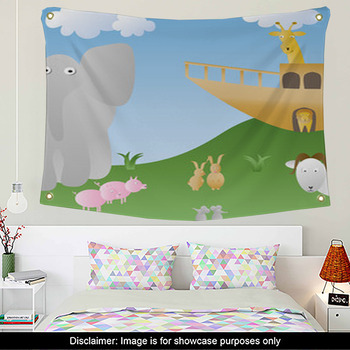 Cram them all together and hope the boat floats with high spirits on the high seas and a custom Noah's Ark wall mural. Capture their surprise at being back on land with muted hues and startled eyes on a soft nave gallery wrap. 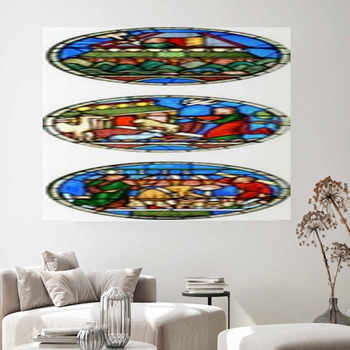 Make the Arks construction a gorgeous stained glass panel in your window with a custom decal. 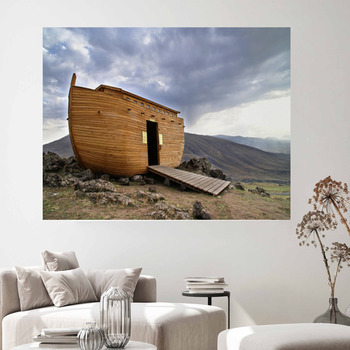 Whether you're after the religious basis of the story or its appeal to all of us because of the animals involved, discover Noah's Ark in your wall art. 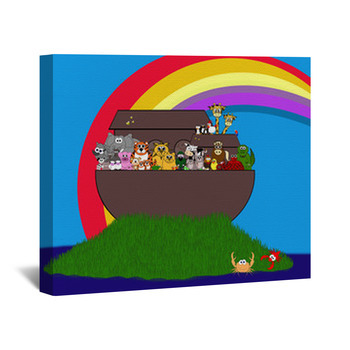 What is it about Noah's Ark that makes it the most believed part of the Bible? Seriously? All the animals, two by two? Together on a boat? And yet, there it is, we don't really doubt it; scientists seek to confirm it. 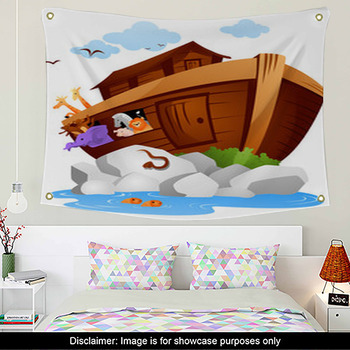 So go for some legendary wall art and let Noah's Ark bob and come to rest in the room. 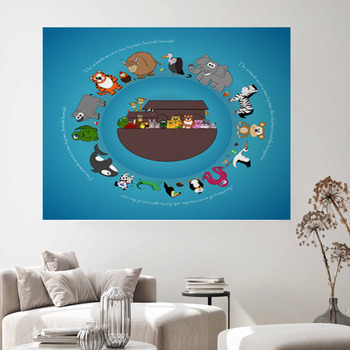 Circle it with animals in a ghostly life-ring on flat teal seas with a Noah's Ark poster. 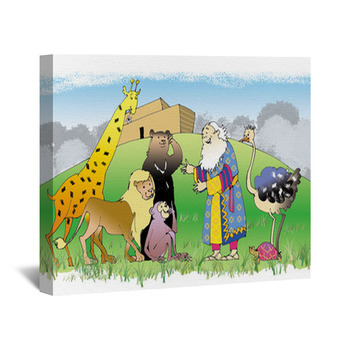 Put the Ark on a wall hanging among the other icons of the Christian faith, in sea blue or bright circles of color. Strand it on an island under clear blue sky with a rainbow of deep red, golds, and purple forming its own arc across a wall sticker. 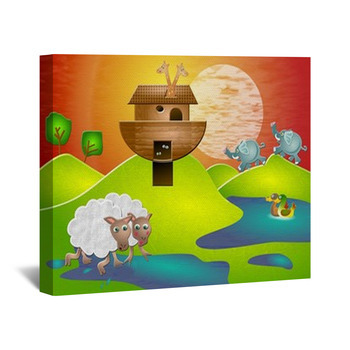 However you choose to portray and display it, let some Noah's Ark wall art float your boat.